ITC India Pvt ltd Mohali (Punjab) is an NABL accredited under photometry discipline providing LM-79 Testing. It has a scope to test all the parameters in LM 79 such as: total luminous flux, efficacy, CCT, CRI, color coordinates and Light intensity Distribution (LID). · All personnel are trained through NPL, New Delhi. · Inter Lab Comparison is done from reputed and approved Labs only. · Approved Lab in LED lighting Facts: a program of the U.S. Department of Energy. · Environmental, Impact and Ingress Protection testing is also performed in the premises. For reference a full report with all the parameters issued by ITC India Pvt ltd is attached. Do have a look for clarity. Download LM-79 Testing Report. Why to go for LM-79 Testing? « LM 79 testing provides performance characteristics of the product. « Key types of measurements provide electrical characteristics, lumen output, spatial distribution of light, and color attributes. LED’s are boon to this contemporary epoch. It is widely used because of its innumerable merits. Let us have a brief look at LED’s expediency to move further to discuss about the Testing of luminaries as per LM 79.
ü Wider variations of size and dimension of final product. Some of you may doubt that if you use a tested LED in your product than “Is it compulsory to go for LM 79 testing for luminaries? Of course Yes, you have to go for LM79 Testing, even on the usage of Tested LED in your luminary. The LED’s are tested according to LM 80 which is a standard to test only LED’s. But in Luminaries, LED is one of the components used in luminaries. The other components of luminary are electrical, some connections, LED’s, optical, thermal and mechanical that make it a new product and requires testing as per LM-79 Testing which is a standard to test SSL and test the LED luminaries for measurements. To be competitive and for good business, you need to test your product as per LM 79, as most of the purchaser requires a test report and prefer to purchase Tested luminaries only. Now, it is clear LM 79 testing has a positive impact on the product. In brief, improvement can be expected, quality enhancement, real picture performance criteria of the product, help in enhancing business. What does LM 79 cover and what it does not covers? It covers the LED based Solid state lighting (SSL) goods with control electronics and heat sinks incorporated, that is, those devices that requires only AC main power or a DC voltage power supply to operate. 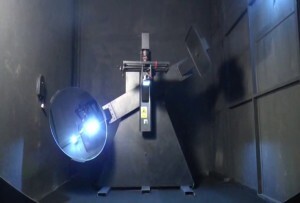 SSL products in the form of luminaries (fixtures incorporated light source) are covered in LM-79 Testing. This standard describes the test methods for individual SSL products. It does not cover SSL products that require external operating circuits and external heat sinks such as LED chips, LED packages and LED module. 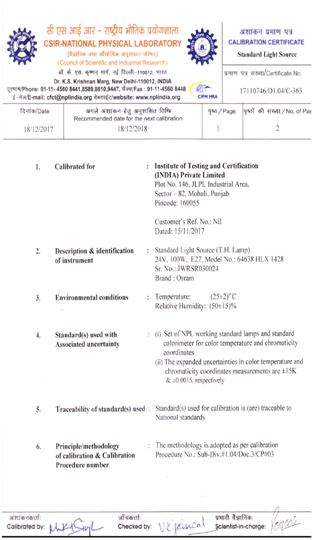 Even this document does not cover the fixtures designed for SSL products sold without a light source and the performance rating of the product. Who can perform LM 79 testing and what does it provides? LM-79 Testing can be performed by laboratories ( www.itcindia.org ) which are accredited through NABL and having their scope in testing because only issued report from such labs is relevant . For photometric parameters Integrating sphere is required and for Light intensity distribution Goniophotometer is needed. A lab having both the machines and valid accreditation with full scope has authority to issue Test reports presenting all the parameters present in the report discussed above. 2. Maintained ambient temperature is 25°±1 °C with limited air flow. The total luminous flux (lumen) of SSL products shall be measured using an Integrating sphere or a goniophotometer. The method may be chosen depends upon what is needed to be measured. For Small sized LED luminaries the total flux and color measurements can be measured in Integrating Sphere. There is no need of the dark room for installing Integrated sphere. The method of mounting can be the primary path for heat flow away from the device and can affect measurements results significantly. 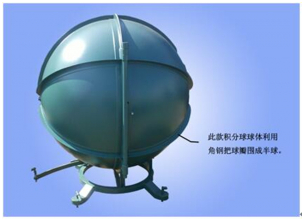 The SSL under test must be mounted in integrating sphere so that heat conditions through supporting objects causes negligible cooling effect. Te product may be held by support materials that has low heat conductivity like Teflon. Even the supporting device does not disturb the air flow around the product. If any support is provided with the SSL, then the product shall be tested with support structure attached. The SSL product under test shall be operated at rated voltage (AC/DC) according to the specification of SSL. If the product has dimmable capability, measurements shall be performed at maximum input power condition. If the product has multiple modes of operations including variable CCT, measurement may be made at different mode of operation if necessary, and such setting conditions shall be clearly reported. The integrated sphere owned by the ITC India pvt is having a spectroradiometer . LM-79 Testing with integrating sphere system: First of all the size of integrating sphere should be large enough to ensure that the measurements errors due to the effect of baffle and self absorption. ITC has Integrating sphere with dia 2 m. The integrating sphere shall be equipped with auxiliary lamp (quartz halogen lamp) for self absorption factor. Before operating the integrating sphere must be calibrated against the reference standard lamp calibrated for total spectral radiant flux. No seasoning is required for new SSL products. Before measurements are taken, the SSL product under test shall be operated long enough to reach stabilization and temperature equilibrium. The time required for stabilization depends on the type of SSL product under test. The time ranges from 30 min to 2 or more hours for large SSL. The ambient temperature is maintained. The stabilization is judged when variation ( max- min) of at least 3 reading of the light output and electrical power over a period of 30 min, taken 15 min apart, is less than 0.5 %. Even the stabilization time used for each SSL must be reported. The software generates the Lm-79 Testing report providing all the parameters: total luminous flux, CCT, CRI, color coordinates discussed above except the light intensity distribution( LID). LM-79 Testing with Goniophotometer system: Now ,For LID measurements goniophotometer is required, which is generally used for relatively large size SSL products. It also provides the total luminous flux in lumen as well. Dark room is required for installation of Goniophotometer with temperature control. Working on goniophotometer is time consuming as compared to Integrating sphere. The LM-79 Testing report generated in Goniophotometer will provides all parameters including LID.